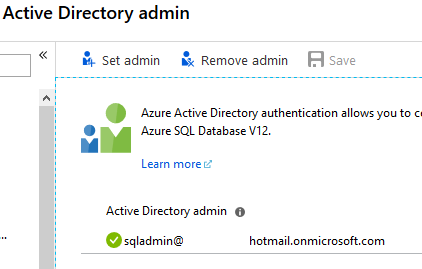 I'm trying to connect to an Azure SQL DB through SSMS (v17.9.1), using an Azure AD user, that is an Active Directory Admin for my SQL Server that hosts my Azure SQL Database. Msg 33159, Level 16, State 1, Line 5 Principal 'sqladmin@myuserhotmail.onmicrosoft.com' could not be created. Only connections established with Active Directory accounts can create other Active Directory users. When you reset a password in Azure AD, it automatically forces the user to change the PW on the next login. 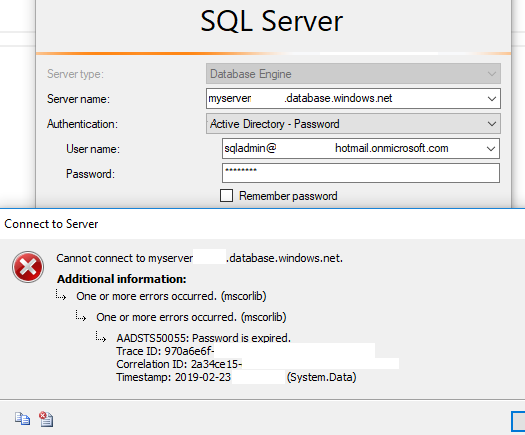 If you immediately attempt to login to Azure SQL it will give you an error that the PW is expired. Log into the Azure Portal as sqladmin@myuserhotmail.onmicrosoft.com, set a new password and this will resolve your issue. Not the answer you're looking for? Browse other questions tagged sql-server ssms azure-sql-database active-directory or ask your own question. Service Principal as SQL Active Directory Admin, does it use Graph API?